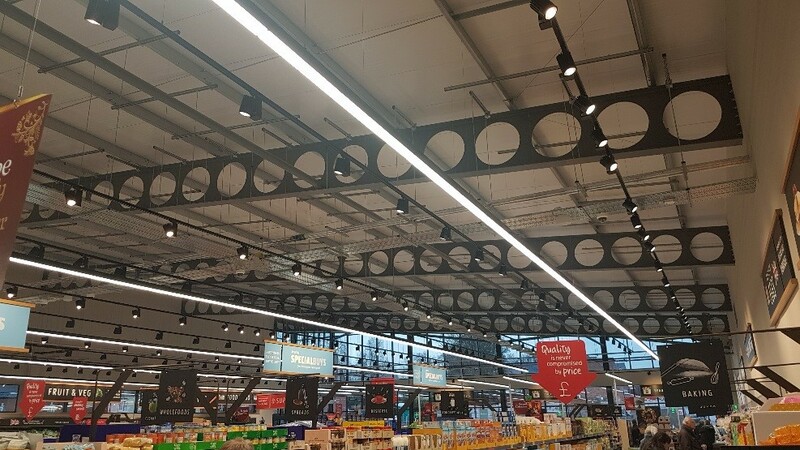 Kloeckner Metals UK Westok designed and manufactured 23m long Cellular Beam rafters for Hayes Engineering for Aldi’s new store at Chellaston, Derby. With a trading area in excess of 1200m2, this interesting Retail development is another example of the growing trend of the architectural use of exposed Kloeckner Westok rafters. Kloeckner Westok Advisory Engineers worked closely with both Consulting Engineer Webb Yates and the Steel Fabricator Hayes Engineering on the design and manufacture of these clear span rafters, which were supplied in one piece to facilitate speedy erection of the frame. If you think Kloeckner Westok could help you on your next project, we’d love to hear from you. We offer a free design service, free CPD seminars, and free analysis, design & BIM software. Contact us here.